Nematobrycon palmeri common name Emperor Tetra. They can grow up to 3-4 cm / 1.5 inches. They are best kept in water parameters of PH range 6.0-8.0, and temperatures of 22-25 Celsius / 72-77 °F. The emperor tetra is a lovely addition to a community tank. They have a variety of colours on there body, black, purple, and silver, with beautiful blue eyes. They are a lovely peaceful fish, they are best kept in a small groups, as they can be shy when kept on there own. 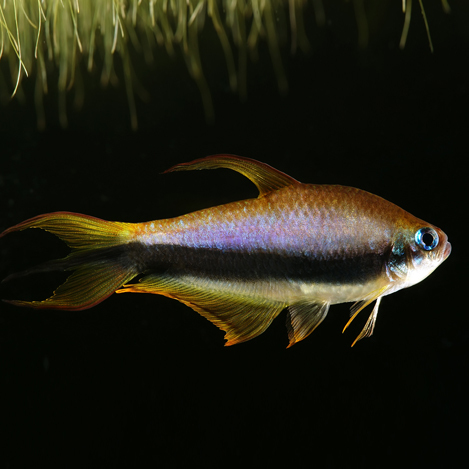 Emperor tetra are not big fish, they only require small size foods. They have a diet of flakes, small pellets, and granular foods. And they enjoy a treat of freeze dried, frozen or live foods. With emperor tetra we only recommend feeding once a day at the most.